Forget the presidential election. Let's talk House committee leadership battles. 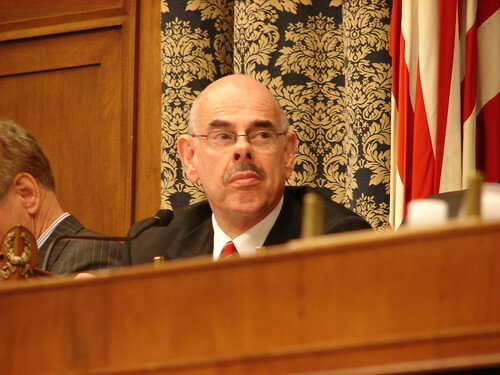 The latest word from the Hill has it that California's Rep. Henry Waxman is going to challenge Michigan's John Dingell for chairmanship of the House Energy and Commerce Committee. Just reading that should be enough to get your pulse racing. If not, read on. As I've discussed before, House and Senate committees (and their chairpeople) can and do exert virtual control over the legislative process. Simply put, if a committee chair doesn't want it to happen, it doesn't happen. The House Energy and Commerce Committee handles pretty much everything having to do with climate change legislation - from things like appliance efficiency standards and mileage standards to renewables and - wait for it - cap-and-trade systems. Dingell, one of the most powerful members of the House, is from Michigan. Detroit is in Michigan. GM, Ford and Chrysler are in Detroit. You get my drift? Dingell is notorious for holding up anything that he perceives to be harmful to the auto industry - that's why the Democrats have made only modest improvements to vehicle mileage and emissions standards (aka CAFE standards). Meanwhile, Speaker Nancy Pelosi and Dingell have a history. In 2002, before she was Speaker, she endorsed a primary challenger to Dingell - a definite no-no for an incumbent. As Speaker, she tried to bypass Dingell by creating a "special select committee" to "advocate" for climate issues. But House committee reform being pretty much impossible, the new committee had no teeth - it couldn't pass legislation so it was irrelevant. Waxman, on the other hand, represents Santa Monica and Malibu, California (i.e. the area north of Los Angeles). Putting him in charge of Energy and Commerce would be like putting a representative from New York City in charge of the Agriculture Committee. Plus, Waxman is an absolute bulldog. Currently chairing the House Oversight Committee, he's been hauling Bush cronies and incompetents in for under-oath thrashings since 2006. If C-Span had an equivalent to ESPN's Sportscenter - highlights from Waxman hearings would be featured nightly. Waxman's attempt to wrest control does violate the informal but ironclad rules of House committee operations. However, if Pelosi backs him and the committee members vote for him, then Waxman will succeed. But Dingell won't go quietly so this is, as Roll Call put it, a brewing battle royal. If Waxman does pull it off, it completely changes the calculation of what's possible for climate change legislation in the country. THAT would be change we can believe in.